Music Director Ludovic Morlot returns to the podium to lead performances of Stravinsky’s rediscovered Funeral Song on January 4 & 6. It’s not every day that you get to hear a premiere by one of the 20th century’s most influential composers. But that’s exactly what you can expect when Music Director Ludovic Morlot returns to the podium to conduct the West Coast premiere of Stravinsky’s Pogrebal’naya Pesnya (“Funeral Song”) on January 4 and 6. Lying hidden for more than a century, the elegiac Funeral Song was thought lost, even by the composer himself. Composed in 1908, the piece was written as a tribute to Stravinsky’s teacher, Nikolai Rimsky-Korsakov. It was performed at a memorial concert for Rimsky-Korsakov in Saint Petersburg in 1909 and subsequently lost during the upheavals of the Russian Revolution. 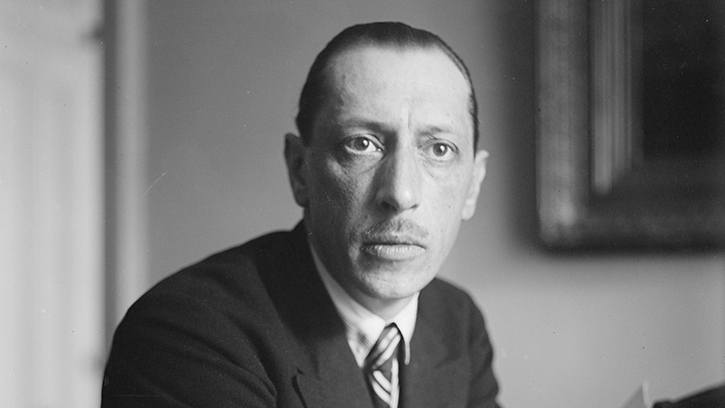 Stravinsky spoke fondly of the work throughout his life, calling it “the best of my works before The Firebird.” Then, 106 years later, the music was rediscovered in the library of the Saint Petersburg Conservatory when Russian musicologist Natalia Braginskaya found a set of orchestral parts buried at the back of a shelf in the library. But the Stravinsky is not the only work receiving a premiere. These concerts also feature the Seattle premiere of another influential 20th century composer, György Ligeti. Violinist Augustin Hadelich joins Morlot and the orchestra to perform Ligeti’s Violin Concerto. Hadelich previously received a Grammy Award for Best Classical Instrumental Solo on the Seattle Symphony's recording of Dutilleux's Violin Concerto, L'arbre des songes. Completed in 1992, Ligeti’s concerto is one of his signature achievements. The music is original, inventive and deeply expressive. The concerto reflects his continuing fascination with non-standard tuning, which is most evident in the opening of the first movement. Ligeti described the sound as a “shimmer” resulting from the juxtaposition of different systems. The music of the second movement takes the form of a beautiful, serene unaccompanied solo, reminiscent of medieval chant. The music is interrupted by a chorus of ocarinas, performed by members of the woodwind section, hinting at the influences of Hungarian folk music that are never far away in Ligeti’s compositions. Music Director Ludovic Morlot returns to the podium to lead the orchestra in a program featuring Mozart’s Symphony No. 39, Stravinsky’s rediscovered Funeral Song and Ligeti’s Violin Concerto on January 4 and 6.